We have had a great question about how exactly does oyster shell offset ocean acidification. This set us off on a search for a clear, concise answer that does not require the reading of academic journals or a doctorate in the field of chemistry. First a bit on ocean acidification. Here is a diagram we found on the Mystic Aquarium's website who has an excellent discussion of the topic. Briefly here how it works. 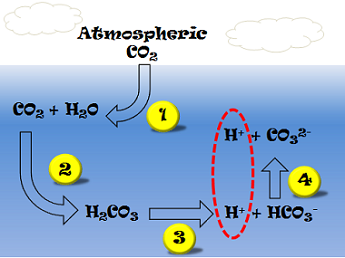 More Carbon Dioxide (CO2) in the air means more Carbon Dioxide dissolves in the water. In the water the a CO2 molecule reacts with a water molecule (H2O) to make a bicarbonate (HCO3) molecule and a free floating H molecule. The free flowing H molecules are positively charged and what makes acid. The more of them there are, the greater the acidity. It sounds confusing, but as the acidity gets higher, the pH gets lower. Now here is how the calcium carbonate comes in. There is a helpful discussion of acid neutralization in Wikipedia. Here is how the Calcium Carbonate (CaCO3) comes in. 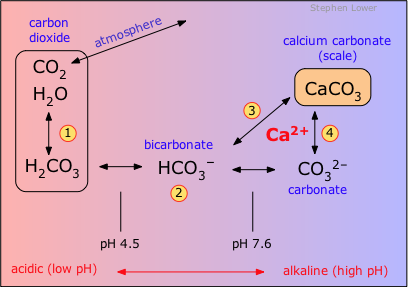 Calcium Carbonate molecules can break down into a Carbonate CO3 molecule and a Calcium Ca molecule. The negatively charged CO3 molecules can soak up more of the free positively charged H molecules. And with a lower concentration of H molecules the acidity drops, raising the pH. It should be noted that the neutralization affects are dependent.on relative concentrations. Does, this explanation helps shed light on the topic? Let us know.